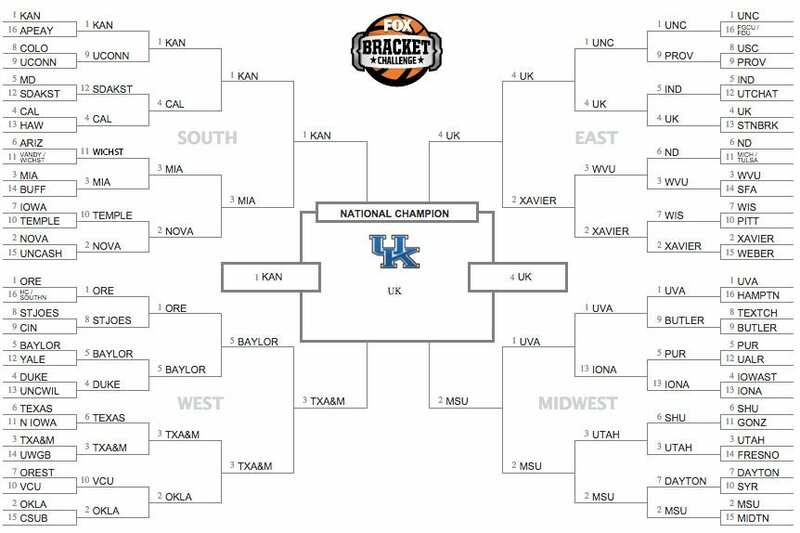 In the weeks and days leading up to Selection Sunday, I worked tirelessly to inform you what the NCAA tournament bracket would look like. Hours of combing RPI records, strength-of-schedule numbers and Sagarin ratings went into that fairly educated endeavor. When it comes to predicting how the actual tourney will play out, however … that’s mostly pure luck. Everybody who’s ever participated in an office pool knows that. So having conducted roughly 45 minutes of research, I feel fully qualified to tell you exactly how the 2016 NCAA tournament will unfold. — The top-seeded Kansas Jayhawks will not lose to a mid-major this year — mostly because they won’t face one. 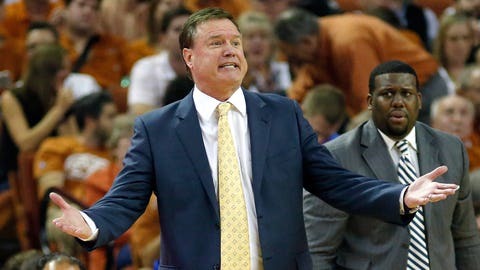 Don’t worry, Bill Self. We see good things for you this year. — No. 12 seed South Dakota State will take out No. 5 seed Maryland in the first round because this year’s indisputably talented Terps, though 25-8, have developed a knack for losing any game of consequence on their schedule. — No. 4 seed Cal, with two lottery picks (Jaylen Brown and Ivan Rabb) and a first-rounder (Tyrone Wallace), cruises to the Sweet 16. That’s as far as it goes, though, because Bill Self vs. Cuonzo Martin is a 1 vs. 16 mismatch. — Wichita State will win its First Four game against Vanderbilt and beat Arizona after that, because once the committee let the Shockers in the tourney they assured at least one big name would go down. — No. 2 seed Villanova will make it to the second weekend for the first time since 2009 but won’t make it past Miami in the Sweet 16. Angel Rodriguez is exactly the kind of steady point guard you want in March. — That being said, Kansas’ is exactly the kind of steady roster you want in March. Which is why the Jayhawks head to Houston. — Fans tuning in to No. 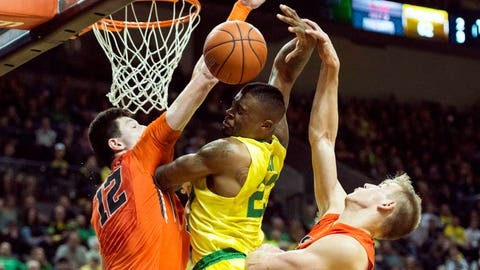 1 seed Oregon’s first game are shocked to learn that Oregon has an actual basketball team. Previously this was only a rumor started by a few people who get something called "the Pac-12 Network." — No. 5 seed Baylor will take out No. 4 seed Duke because the Blue Devils aren’t particularly good this year. They tricked the committee largely because Mike Krzyzewski could win 23 regular-season games with five walk-ons. The nation will soon learn that Oregon has a basketball team too. — In their first meeting since all the way back on … the day before Thanksgiving, archrivals Texas and Texas A&M stage an epic Round of 32 clash. The Aggies win* and reiterate afterward they will never, ever get back together in football. — Oklahoma star Buddy Hield scores 43 points against Round of 64 opponent CSU Bakersfield and 47 points against Round of 32 opponent VCU. — Texas A&M holds him to 18 on 4-of-13 three-pointers to advance to the Elite Eight. — In a game that sets the Guinness World Record for amount of neon in one place, Baylor upsets Oregon in the Sweet 16. There’s always one region where the bracket goes haywire, and this is it. — It’s No. 3 seed Texas A&M* vs. No. 5 seed Baylor for a spot in the Final Four — just as everyone predicted when they met on Dec. 19. The Aggies roll — just as they did on Dec. 19. * On a podcast recorded Monday morning I picked Texas to beat Texas A&M and reach the Final Four. On Monday afternoon I changed my mind. It happens. 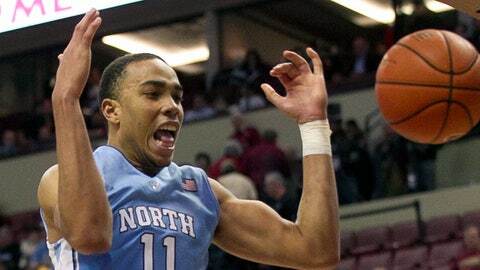 — Led by stars Marcus Paige and Brice Johnson, No. 1 seed North Carolina looks every bit like preseason No. 1 North Carolina in dispatching a play-in winner and No. 9 seed Providence. — Led by star Tyler Ulis and Jamal Murray, preseason No. 2 Kentucky makes March’s dominant Tar Heels look like February’s erratic Tar Heels in a surprisingly easy Sweet 16 win. — No. 3 seed West Virginia — a.k.a. Press Virginia — survives a scare from similarly built 14th seed Stephen F. Austin, whose coach, Brad Underwood, takes a power-conference job by the Sweet 16. Tough break, North Carolina. Kentucky’s in your region. — No. 2 seed Xavier handles No. 15 seed Weber State and No. 7 seed Wisconsin, during which time Edmond Sumner and Jalen Reynolds vie to see whose thunderous dunk will make "One Shining Moment." — The Musketeers take down the Mountaineers in the Sweet 16 because Xavier has long been former Cincinnati coach Bob Huggins’ Kryptonite. 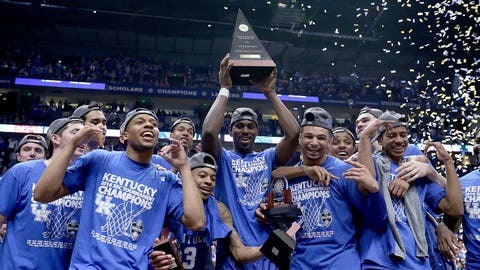 — Kentucky returns to the Final Four for the fifth time in six seasons, after which John Calipari tries to play the "nobody believed in us" card for the fifth time in six seasons. — Americans far and wide are shocked to learn the news that No. 1 seed Virginia is not a fraud this year. 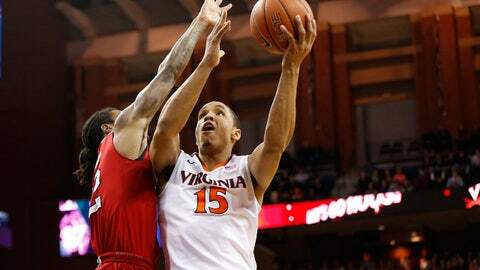 Malcolm Brogdon and the Cavaliers smother Hampton and No. 9 seed Butler. — Led by breakout tourney star AJ English, No. 13 seed Iona sends No. 4 Iowa State to its second straight first-game exit. No. 12 seed Little Rock would join the party from any other region but drew an unfavorable matchup with Purdue. — Isaiah Whitehead-led Seton Hall continues its triumphant run from the Big East tournament … right up until the Round of 32, when it runs into No. 3 seed Utah’s imposing 7-footer Jakob Poeltl. Virginia’s no fraud, but are they Final Four material? — Iona knocks off Purdue to reach the Sweet 16, the deepest run in school history, earning the nickname Dunk City Three-Point Municipality. — Virginia ends English’s run. Michigan State ends Poeltl’s. — The Cavs and Spartans meet in the tourney for a third straight season. For the third straight season, Virginia is the higher-seeded team. For the third straight season, we forget that was the case. Michigan State becomes the first school to reach both the football and basketball Final Four. 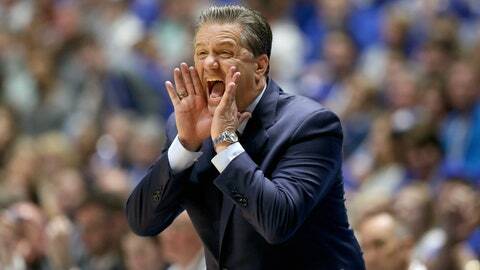 — Kentucky coach John Calipari skips the day-before press conference, but nobody notices. An NCAA representative presses play on a boilerplate video of Calipari defending one-and-dones and debunking NBA rumors. — Grizzled Kansas veteran Perry Ellis sits in the Jayhawks locker room answering reporters’ questions about what it was like to play in the 1997 tournament. — In the first semifinal, Kansas jumps to a 16-2 lead on Texas A&M, which freaked out upon realizing an hour before the game that, holy crap, we’re in the Final Four. The Jayhawks cruise. — In the second game, Kentucky’s Ulis and Michigan State’s Denzel Valentine wage an as-advertised matchup of first-team All-Americans. The Wildcats prevail because, well, they’re clearly more talented. — It’s a rematch of the 2012 national championship game pitting the bluest of bluebloods. It’s also the rare occasion when Kentucky’s opponent faces higher expectations than Kentucky. Kansas hangs for 35 minutes, but the Wildcats cut down the nets. Guess who’s getting another title, even though no one believed in him? Afterward, Calipari plays the "nobody believed in us" card.